Unlike other career books, this book offers managers a team-focused approach to neutralizing a not-so-pleasant or productive working atmosphere. Instead of isolating the one problem employee, relevant teams are considered as part of the solution. The result? Solutions stick and there's less likelihood of the bad apple ruining the bunch. Complete with situational advice and case studies taken straight from the trenches, this simple and straightforward guide teaches managers how to:Calm down combatantsMotivate wastersSilence gossipsDe-arm backstabbersConvince passive-aggressives to open upTeach narcissists the importance of the team This book helps managers decide what the right course of action is whether it means chastising negative behavior, encouraging positive outlooks, separating certain folks, creating teams for success, giving employees warnings, and/or firing the ones who are pretty much rotten through and through. 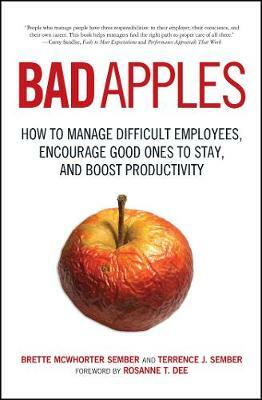 This book is essential reading for any manager looking to ensure a pleasant, productive and fruitful work environment.